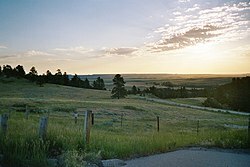 Niobrara County is a county in the U.S. state of Wyoming. As of the 2010 United States Census, the population was 2,484,  making it the least populous county in Wyoming. Its county seat is Lusk. Its eastern boundary abuts the west lines of the states of Nebraska and South Dakota. As of the 2000 United States Census,  of 2000, there were 2,407 people, 1,011 households, and 679 families in the county. The population density was 1 person per square mile (2.6/km²). There were 1,338 housing units at an average density of 0.5 per square mile (0.2/km²). The racial makeup of the county was 98.05% White, 0.12% Black or African American, 0.50% Native American, 0.12% Asian, 0.50% from other races, and 0.71% from two or more races. 1.50% of the population were Hispanic or Latino of any race. 35.1% were of German, 18.7% English, 11.2% Irish and 5.7% American ancestry. There were 1,011 households out of which 27.10% had children under the age of 18 living with them, 57.60% were married couples living together, 6.00% had a female householder with no husband present, and 32.80% were non-families. 29.50% of all households were made up of individuals and 14.10% had someone living alone who was 65 years of age or older. The average household size was 2.28 and the average family size was 2.81. The county population contained 22.60% under the age of 18, 6.10% from 18 to 24, 26.00% from 25 to 44, 26.60% from 45 to 64, and 18.70% who were 65 years of age or older. The median age was 43 years. For every 100 females there were 95.20 males. For every 100 females age 18 and over, there were 88.80 males. The median income for a household in the county was $29,701, and the median income for a family was $33,714. Males had a median income of $25,909 versus $17,016 for females. The per capita income for the county was $15,757. About 10.70% of families and 13.40% of the population were below the poverty line, including 15.00% of those under age 18 and 15.60% of those age 65 or over. Like almost all of Wyoming, Niobrara County is overwhelmingly Republican. No Democratic Presidential candidate has won Niobrara County since Franklin D. Roosevelt beat Alf Landon in 1936 by thirty-eight votes, and none since Lyndon Johnson in 1964 have passed thirty percent of the county’s vote. ^ a b "State & County QuickFacts". US Census Bureau. Archived from the original on July 15, 2011. Retrieved January 25, 2014. ^ "Science for a changing world". www.usgs.gov. Retrieved June 22, 2018.